to assistance with hygiene after using the toilet. 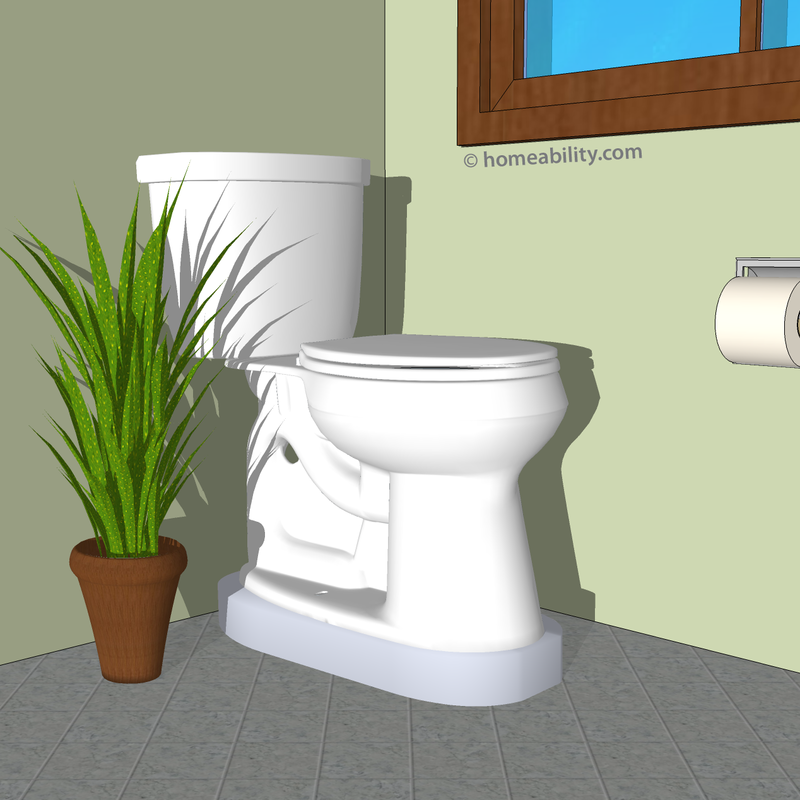 Replace the existing toilet with a new toilet that comes equipped with the accessibility features you desire. In order to determine which pathway is right for you, it’s helpful to first understand what your options are. We have provided a quick overview of the different options below to aid you in determining which is one best for your home and personal needs. 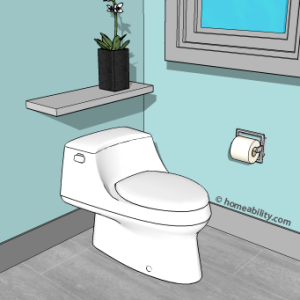 A variety of different equipment can be added to, or around, your existing toilet to make it more accessible and easier to use. If you have sensitive skin or difficulty wiping, a specialized bidet-style toilet seat can be added to the existing toilet, making it possible for you to perform toilet hygiene without needing to physically wipe using toilet paper. Learn more. 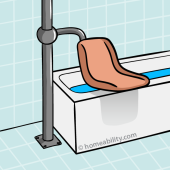 If you struggle to stand up from a low toilet, removing your existing toilet seat and replacing it with a taller toilet seat model is one option to make the transfer from sitting to standing easier. Alternatively, you can insert a spacer under your existing toilet seat to raise the toilet seat height. Learn more. 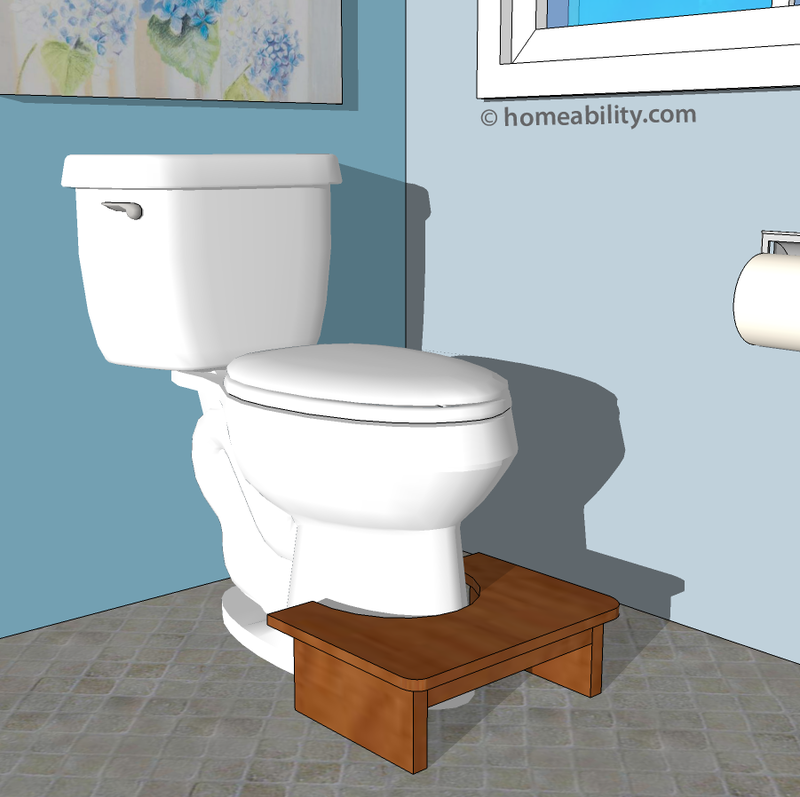 Another option for raising the height of the toilet seat is to purchase a toilet pedestal (aka toilet plinth) and have a plumber install it under the base of your existing toilet. This solution acts to raise the overall height of the toilet. Learn more. Toilet rails provide a great place to hold on to when sitting down and a helpful place to push up from when standing up. 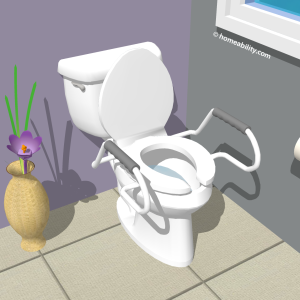 They exist in a variety of forms, which include ones that are attached to specialized toilet seats, models with legs that extend down to the floor on either side of the toilet, or alternatively grab bars can be attached to the wall behind or along side the toilet. Learn more. A step-stool can be a helpful addition for persons who experience difficulty moving their bowels, because it makes it possible to sit with knees positioned above the hips creating a traditional “squat-like position”, which is considered to be a more natural position for moving the bowels. Persons with short legs can also benefit from adding a step stool at the base of the toilet to prevent their legs from dangling when seated on the toilet. Learn more. Specialized power-assisted toilet seats (aka “toilet seat elevators” and “power toilet seat lifts”) exist that can mechanically assist you with standing up from the toilet. With the push of a button, the seat assists to slowly raise you up, making the transition from sitting to standing easier. 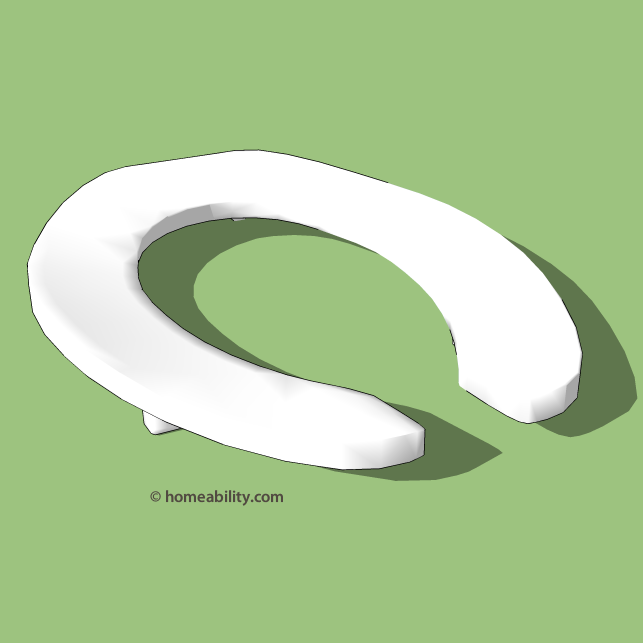 Some problems can be fixed by simply replacing the existing toilet seat with a new one. Toilet seats are available in narrow and wide seat widths, making it more comfortable for persons of differing sizes. Models can also be found with a cut out portion at the front or back of the seat making it easier to reach down to perform hygiene. 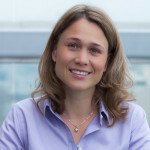 Some models include padding to enhance comfort for those with sensitive skin. Learn more. 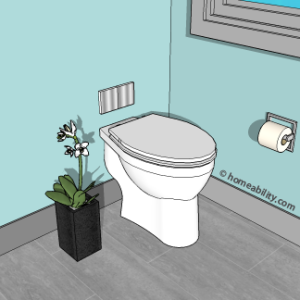 Which Type of Toilet is Most Easily Accessible? Below you’ll find a quick overview of the different toilet types. Beside each we have identified some of the key elements that make each of them more or less easily accessible to aid you in determining which one will best match your own personal needs and architectural features of your bathroom. What Is It? 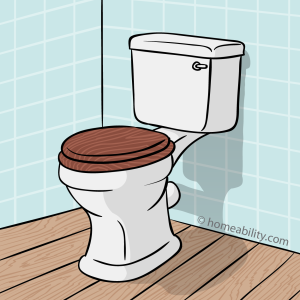 A two-piece toilet consists of a toilet bowl supported by a floor-mounted pedestal and a separate water tank that is bolted to the back. Con: This type of toilet occupies a lot of floor space, which can make it more difficult to move around inside of a small bathroom if you use a walker or wheelchair. Con: Occupy a lot of floor space, which can make it more difficult to move around inside of a small bathroom if you use a walker or wheelchair. What Is It? 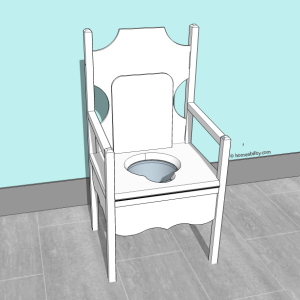 A comfort-height toilet has a higher-than-average toilet seat height of 17-19 inches measured from the floor to the top of the seat, whereas, most toilets have a seat height of 16″ or less. 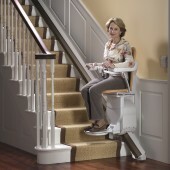 Makes it easier for taller individuals to sit down and stand up from the toilet. Makes it easier for some wheelchair users to slide from their wheelchair seat onto the toilet seat. Wheelchair users will have different wheelchair seat heights, so this needs to be addressed on a case-by-case basis whether a higher toilet seat height is appropriate or not. Con: Persons who are shorter in stature tend to find these toilets to be uncomfortably high. It can cause their feet to dangle down, which in turn can make the legs go numb while seated on the toilet. Alert: If you are seeking a toilet with a taller seat height, it is helpful to be aware that there is a difference between a toilet’s ‘bowl’ height and ‘seat’ height. The bowl height is the measurement taken from the floor to the top rim of the bowl and the seat height is the measurement taken from the floor to the top of the seat. Many manufactures only list the toilet’s bowl height because the toilet & toilet seat are normally purchased separately. When you only see the bowl height listed, you can assume that on average most standard toilet seats will add another 1″- 1.5″ when placed on top the bowl. To learn more about picking the best toilet seat height, click here. What Is It? A back-to-wall toilet has a floor-mounted toilet bowl and the water tank is concealed inside the wall. Pro: Since the water tank is stored inside the wall, there is more clear floor space available in front of the toilet bowl, which can increase usable clear floor space in front of the toilet by as an additional 10-12 inches, making it easier for a person using a walker or wheelchair to move around inside the bathroom. The bathroom wall will need to be opened up to install the water tank inside and the wall will need to be refinished afterwards. If you are remodeling an existing bathroom (versus building a new bathroom) the plumbing will need to be modified to get the pipes inside the toilet and the pipes in the floor to line up appropriately together. What Is It? 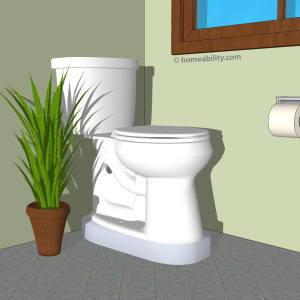 This type of toilet does not require a pedestal base to support the bowl. Both the water tank and bowl are attached to the bathroom wall. The lack of pedestal base will allow most wheelchair’s footrests to pass underneath the bowl (if the wheelchair user doesn’t have elevated leg rests). 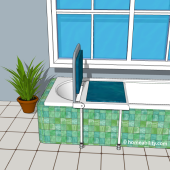 This can increase usable clear floor space for many wheelchair users by approximately 6 inches, making it easier to move and turn around inside the bathroom. Con: More expensive to install than a floor-mounted toilet, because it requires opening up the bathroom wall and installing a carrier system and the toilet tank inside the wall and the bathroom wall must be refinished again afterwards. What Is It? The toilet bowl and flush controls are fixed to the front of the bathroom wall. A support structure (aka carrier system) is installed inside the wall to support the toilet bowl and house the water tank, which is neatly concealed away inside the wall. 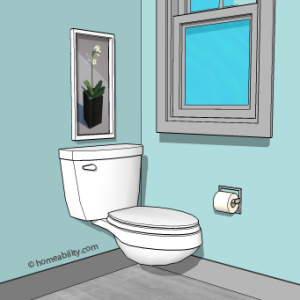 Since the water tank is hidden inside the wall, more clear floor space is available in front of the toilet bowl (often as much as an additional 10-12 inches of space), making it easier for a person using a walker or wheelchair to turn around inside the bathroom. The lack of pedestal base will allow most wheelchair’s footrests to pass underneath the bowl (if the wheelchair user doesn’t have elevated leg rests). This can further increase usable clear floor space for many wheelchair users by approximately 6 inches, making it easier to move and turn around inside the bathroom. The lack of pedestal base makes it easier to mop underneath the bowl. Con: More expensive to install than floor-mounted toilets, because there are more parts to purchase (I.e. 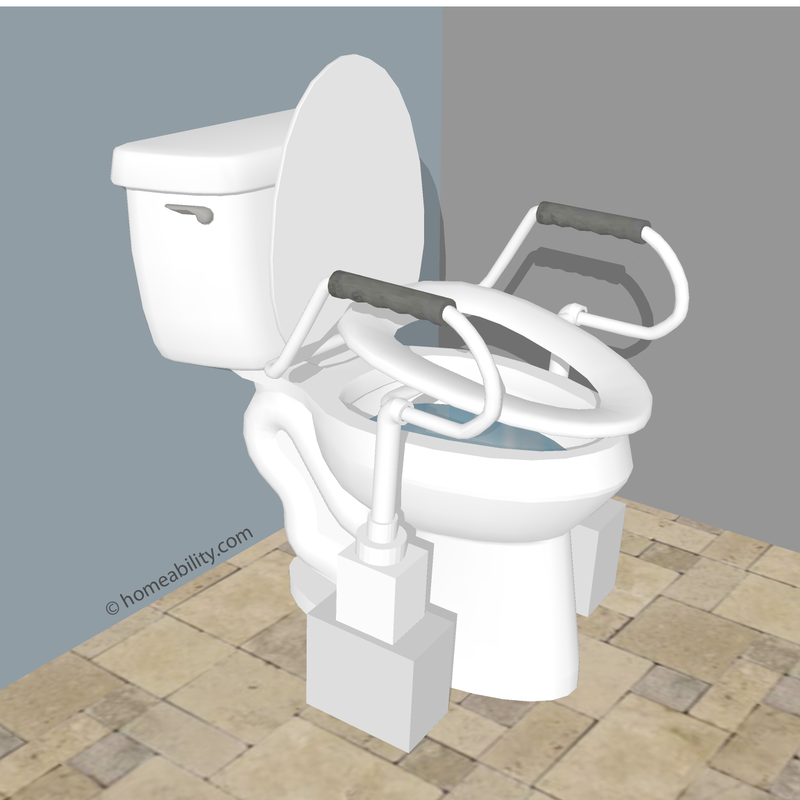 toilet and carrier system) and because the bathroom wall needs to be opened up in order to insert the carrier system and water tank inside the wall. Then the wall needs to be refinished afterwards. 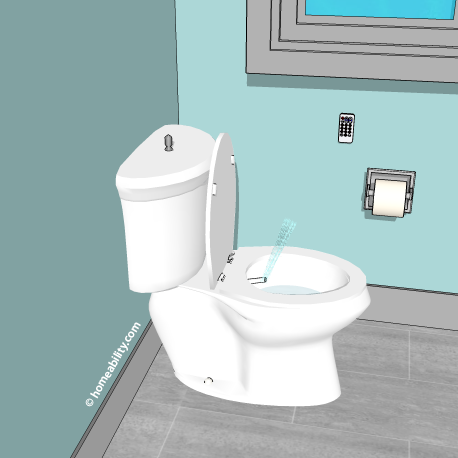 Alert: A carrier (the support structure installed inside the wall) will have different specifications for the min and max height the toilet can be installed. If you are very short or very tall, confirm that the carrier for the model you select will allow you to install the toilet at the height range you require. Also confirm that the weight limit is suitable for your needs. Some carriers can support up to 1000 pounds. Con: In most cases, a corner toilet will still extend out about the same distance into the room, so you will not necessarily gain more free clear floor space in front of the toilet bowl. If your bathroom is small and you use a walker or wheelchair, the smaller the toilet you select, the more space you will have to move and turn around inside the bathroom using your mobility device. 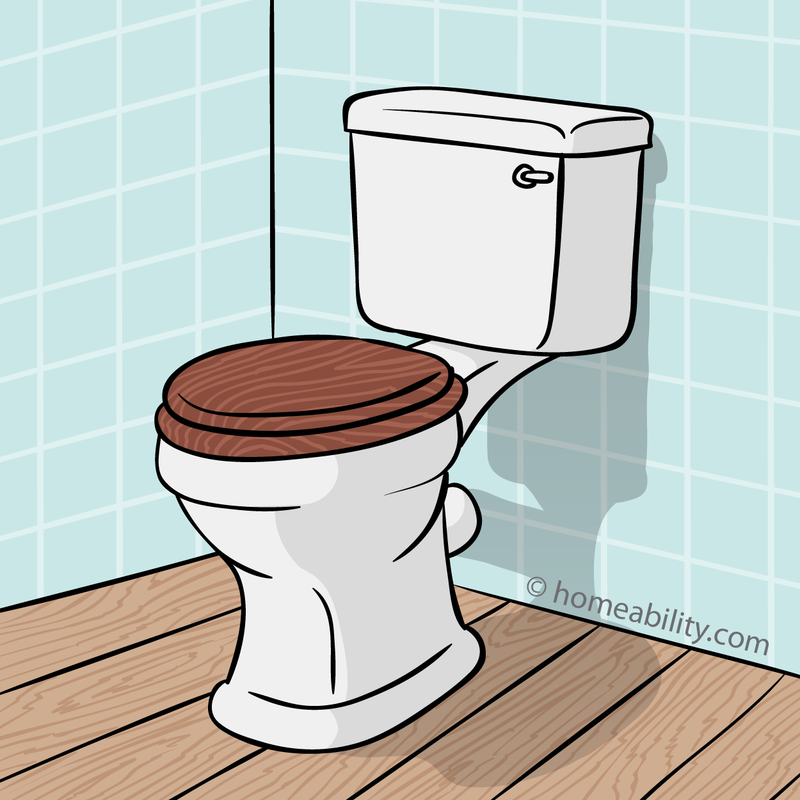 A toilet with a compact-sized toilet bowl (round or square) is a good consideration if your bathroom is small. 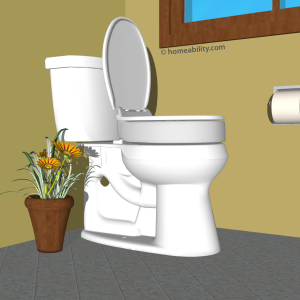 Most compact-sized toilet bowls occupy less floor space (often 2″ less) than models with elongated bowls. In a small bathroom, every inch counts! 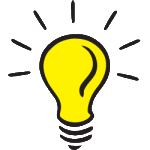 Manufacturers typically do not list the maximum weight capacity when listing a toilet’s specifications. 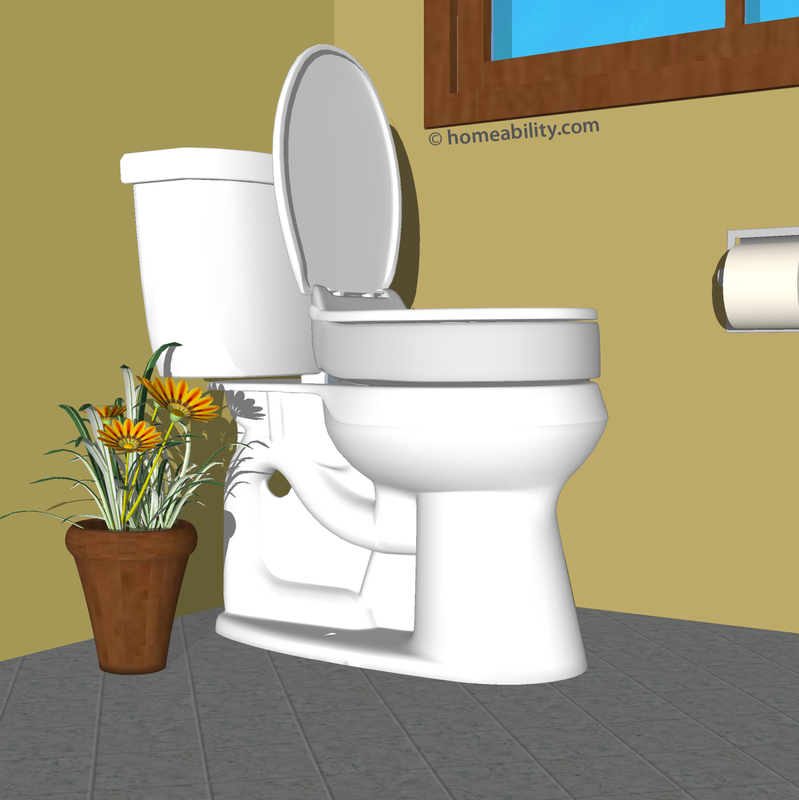 If installed correctly, most wall-mounted toilets will accomodate a minimum weight capacity of somewhere between 350 lbs up to 500 lbs. The specific amount will vary based on the model selected. 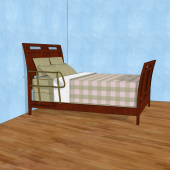 A few wall-mounted models can accomodate up to 1,000 pounds. 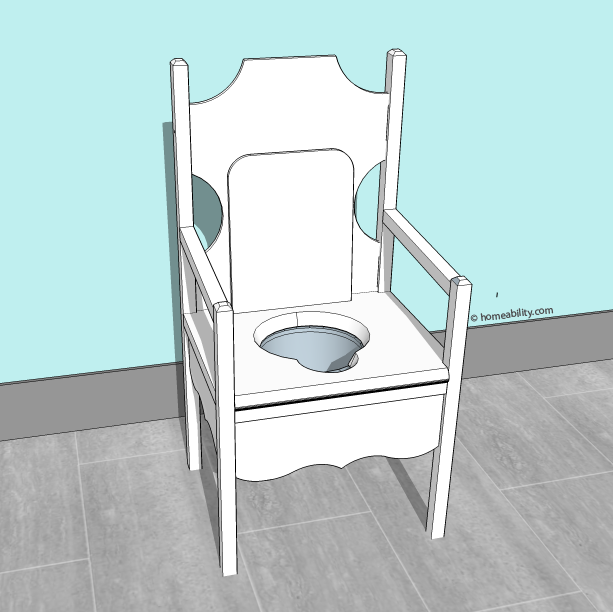 For the pedestal-style floor mounted toilets, the weight capacity varies by manufacturer. 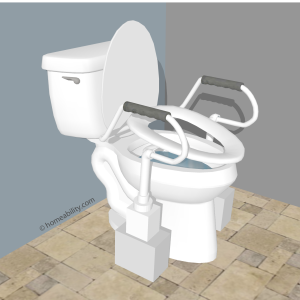 When we contacted American Standard and Kohler, the representatives we spoke to reported that as a general rule of thumb all of their floor mounted pedestal based toilets can accomodate 1000 pounds of static, vertical force. The representative we spoke to at Toto reported that as a general rule of thumb most of their pedestal-style floor mounted models can accomodate somewhere between 400 lbs to 500 lbs. If there are persons living in your household who have bariatric needs, we recommend to confirm with the manufacture what the maximum weight limit is for the model selected prior to purchasing. 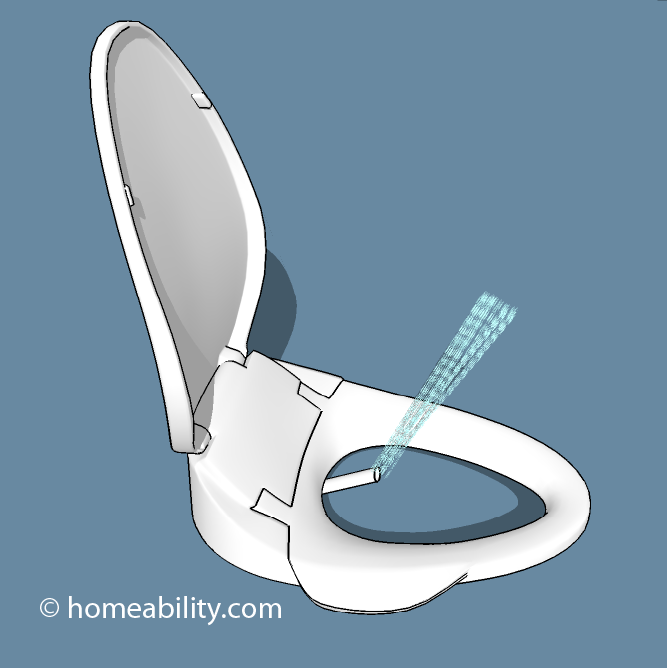 The toilet flusher comes permanently fixed to a specific part of the toilet, so it is important to take this feature into consideration prior to selecting a toilet model. Toilet flushers come in four different types and can be found in a variety of locations, which include: a lever-style handle located on the right or left front-side of the toilet tank; a button that is located on the top center of the toilet tank or on the wall behind the toilet, a pedal located at the base of the toilet that can be operated using a foot, or an automatic touch-less flusher that is operated via sensors. 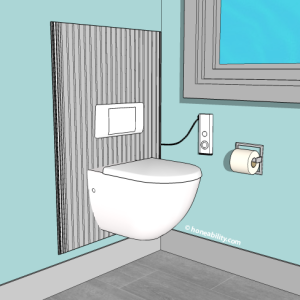 Floor-mounted toilets are easiest to install. 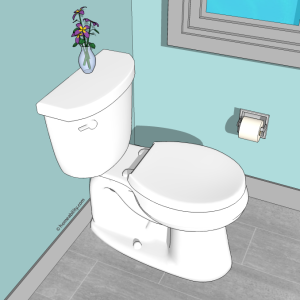 Any licensed plumber should be able to install a floor-mounted toilet correctly. 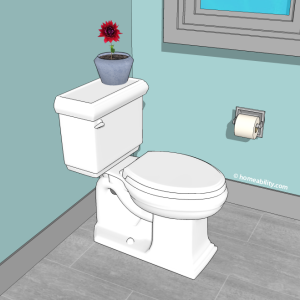 If you have a wall-mounted toilet installed, it is important to select a professional who is experienced with installing this type of toilet to ensure the support structure is installed inside the wall correctly. If you are anxious to conserve space inside the bathroom, but finances won’t permit you to purchase a wall-hung toilet, then a “floor-mounted” toilet with the tank concealed inside the wall is a good consideration. 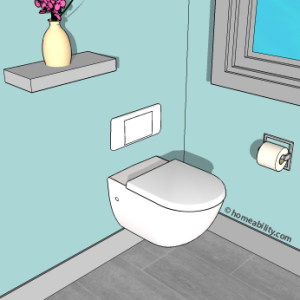 It is less expensive to install than the wall-mounted toilets because it does not require the same support structure, but can still help to conserve space since the tank is neatly hidden away inside the wall. If both space and finances are limited, a good compromise is to install a “floor mounted back-to-wall” toilet. 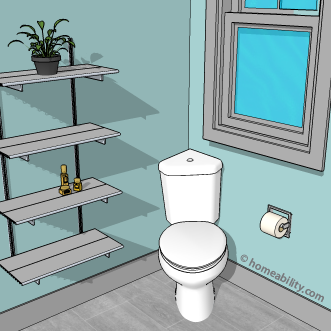 The water tank is tucked away inside the wall, so you gain extra floor space, but it does not cost as much to install because the pedestal base supports the weight of the toilet (and you), hence less structural changes need to be made to the wall. Bidet-toilets (and bidet-toilet seats) are a great consideration for everyone! It does the washing – no wiping required. A toilet that’s enhanced with bidet features can be a particularly helpful addition for persons suffering from incontinence because it makes it much easier to stay fresh and clean. It can also be a great relief for persons with hemorrhoids. Some models (ones with a more powerful water stream) can be helpful for persons who suffer from constipation as well. If you are on a tight budget, replacing your existing toilet seat with a “bidet-style toilet seat” is a much more budget-friendly option than installing a new toilet with bidet features integrated into the design.